In this 65-minute DVD, originally shot on b&w 16mm, we get a full scope of what working at the lumber camps in northern New England looked like, and much more from this film knowledgeably narrated by C. A. Hamilton. It is hard to believe it was less than hundred years ago that pulp wood and lumber were (in some places) still being pulled out of the Maine woods with teams of horses and brought to the riverside or laid out on a frozen pond for the spring log drive. 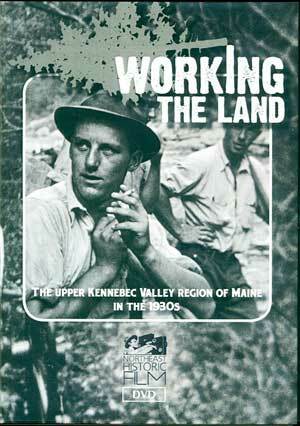 In Working the Land: The Upper Kennebec Valley Region of Maine in the 1930s, we see trees come down, teams pulling wood, great shots of a river drive at Moxie Falls in Moxie Gore, ME, and late spring scenes using the teams to grow hay and oats to feed the horses year-round. Plus some nice shots of haying and collecting shocks of oats by hand and a threshing machine run by a stationary engine making oats and oat straw. And many good scenes of lumber camp and general farm life in the 1930s! At the end of the film are some interesting shots of plowing snow with a large V-plow on a truck in the town of Bingham, Maine and a model T truck set up to run on a railroad track on the Someset Railroad from Bingham to Rockwood. An amazing look into the past of northern New England. New from the N-News, $14.95 plus s&h. This entry was posted in DVDs by N-News. Bookmark the permalink.